Word from Left 4 Dead 2 developer Valve is that we'll get to see the 2nd campaign from the game at the San Diego Comic Con. Not only will we get a glimpse at what Swamp Fever has to offer, we'll get a chance to play it at the EA Lounge when the show kicks off on July 23rd. There's very little info above and beyond the above image that was sent along with the media blurb. If anything, it's a stark contrast to the first set of images that came out of E3. These showed a day lit New Orleans style town, while the above image is dark, gloomy and rainy. 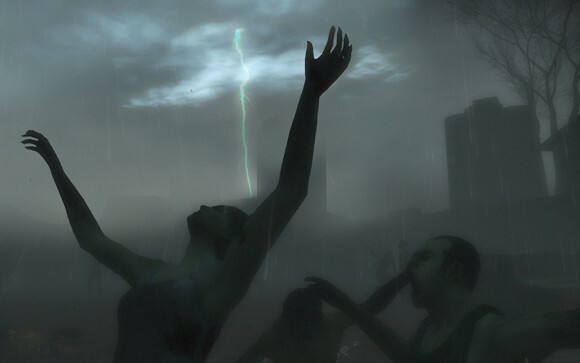 Lets just hope we don't have to avoid lightning as well as zombies!